My name is Marie Coughlin and I work for Public Health England (PHE) as a screening and immunisation manager. Some of you may remember my recent blog about work to tackle screening inequalities in Merseyside. 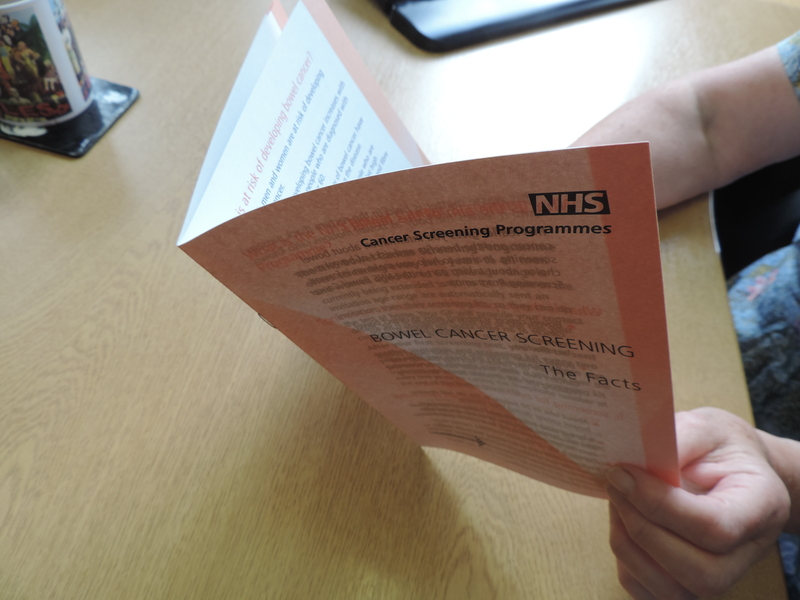 This blog looks specifically at the work we undertook as part of the plan to reduce inequalities in bowel cancer screening. Bowel cancer screening is a common focus in Merseyside due to the low uptake rates we have in parts of the area. We carried out some interesting initiatives as part of this campaign, which I'd like to tell you about. In Sefton, Liverpool and St Helens, we delivered messages on the back of till receipts in certain shops. The campaign was low cost and provided an opportunity to distribute health promotion messages to members of the community who may not otherwise access this information. While recognising that screening is a personal choice, efforts were made to improve accessibility and reduce the inequalities which can make it less likely for certain groups to take part. Invitation letters were sent out to people who hadn't previously attended to take part in bowel cancer screening from the patient's GP, rather than the bowel cancer screening hub, as is usual. Of the practices that took part across Cheshire and Merseyside, almost 12,000 letters from GPs were sent with over 1,000 people who hadn't previously been screened taking up the offer. As well as giving fire safety advice such as fitting smoke alarms, the fire service is increasingly using safe and well visits to provide more general health and wellbeing information. We worked with local fire and rescue teams so they would take bowel cancer screening information with them on their visits and ask eligible householders if they wanted to ask for a bowel screening kit. In total, Cheshire Fire and Rescue Service conducted almost 9,000 visits, resulting in over 700 requests for a screening kit. This project aimed to reduce inequalities in bowel cancer screening rates in black and minority ethnic (BAME) communities. There was training for 12 GP staff and 12 social inclusion team members to support individuals who struggle to access bowel cancer screening services due to barriers, such as language. BAME representatives, GPs, Liverpool City Council, CCGs, Liverpool Community Health, Cancer Research UK and the University of Liverpool were all involved in the partnership to run this project. Although it has not yet finished, early results indicate the positive impact it has had. Overall between 2013/14 and 2015/16 bowel cancer screening uptake increased across all 6 of the CCGs we covered - Halton, Knowsley, Liverpool, Sefton, Southport and Formby, and St Helens. Liverpool had the largest increase, with a rise of 3.1% between 2013/14 and 2015/16, higher than the England average (2%). The majority of the increases were made in the first year of the plan (2014/15). We were really pleased with the results and if you'd like to get in touch I’d be delighted to speak to anyone else who’d like to try similar initiatives. Earlier this year (2018) PHE published its screening inequalities strategy. Part of PHE's approach is to share local learning and experience and put you in touch with people undertaking similar projects. Please write this up and publish it in a peer reviewed journal so that the work is easy to find and to reference when other programmes want to do similar work. If you can't find statistical advice to write it up I'd be happy to help.